Storing your belongings, whether in your own home, or off-site in a storage facility, means taking security measures. Most people invest in a simple padlock to keep their unit locked-up and their items protected while they are not there, but is that $5 lock really enough? Below are some more robust lock options to ensure that your items are protected at all times. Most people will recognize a cylinder lock from the front door of many homes. They are typically flat and round and are a great option for self storage because they are nearly impossible to cut with bolt cutters (simply too hard and thick). They vary in price from $10 to $100. One notable downside is that they are somewhat complicated to replace or fix if you don’t have any experience. These are similar to traditional padlocks, except they are round and more difficult to break into. They are commonly available at most hardware stores, and it is easy to find one that will fit your storage facility door. There are certainly $5 options on the market, but spending a little more will buy a more robust and secure disc lock. The shackle is the u-shaped part on your padlock. Open shackle padlocks are the most common self storage locks, and normally the cheapest, but also the least secure. A closed shackle padlock is one where the shackle is encased in a protective barrier, making it much harder to cut with bolt cutters. The question of whether your $5 lock is enough security really depends on the level of security you require. If you are keeping valuable items in your storage unit that would be either extremely costly, or impossible to replace (because of sentimental value), you probably are not going to feel too comfortable with a $5 lock. 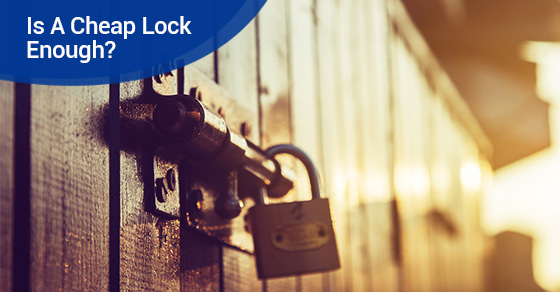 On the other hand, if your self storage facility has comprehensive security measures in place (including cameras and adequate staff), you might feel confident enough to purchase the tried and true $5 padlock. Either way, keep the above lock choices and considerations in mind, and choose the lock that is right for you and your security needs.